The Illuminate Look' is the latest trend marching on most international runways this season. It celebrates sparkle without any reason. 'The Illuminate Look' is all about shimmer, translucent and lustrous makeup, with a reflective shimmer finish. The Lakme Absolute Illuminating Foundation is the latest addition to Lakme?s new range of Illuminating Makeup, to create red carpet luster every day. The Lakme Absolute Illuminating Foundation is a liquid foundation specially created by the backstage experts at the Lakme Fashion Week to give you visibly brighter looking skin. The Lakme Absolute Illuminating Foundation gives you luminous skin with a natural glow. The Lakme Absolute Illuminating Foundation gives you even coverage with a silky, dewy finish resulting in the visibly brighter looking skin. Buy Now! Luminous skin with natural glow. 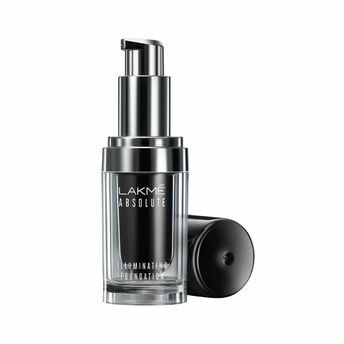 The Lakme Absolute Illuminating Foundation gives your skin an even coverage. Helps you create a red carpet luster every day. Explore the entire range of Foundation available on Nykaa. Shop more Lakme products here.You can browse through the complete world of Lakme Foundation .Alternatively, you can also find many more products from the Lakme Absolute Illuminating Foundation range.